Just south of US-84 and the Columbia River in Eastern Oregon lies land rich in history and agricultural tradition. The off-the-beaten-path towns located here are well worth a side trip for the unexpected discoveries you’ll find. This route through Umatilla, Hermiston, Echo and Heppner opens up a world of wildlife and watermelons, of Oregon Trail history and modern-day wine pioneers, of scenic back roads and stunning mountains. Sitting on the south bank of the Columbia River on US-82, Umatilla (pop. 7,000) was named for the Native American tribe that first resided here and whose descendants make up the present-day Confederated Tribes of the Umatilla. The town saw its heyday during the gold rush days of the 1860s, when its location on the river made it a key point in transportation. The Umatilla Chemical Depot played a role in WWII and Cold War chemical storage, a practice that ended in the 1990s. Head down to the river at the Umatilla Marina R.V. Park, a great spot for boaters, and the McNary National Wildlife Refuge, with walking paths around the ponds and sloughs that provide key habitat for migrating and resident water birds as well as other wildlife. Visit the nearby Pacific Salmon Visitor Information Center at McNary Lock and Dam to learn about the life cycle of salmon and the history of hydropower in the Columbia. Don’t miss your photo op with the giant cowboy outside the grocery store, a real John Wayne look-alike. 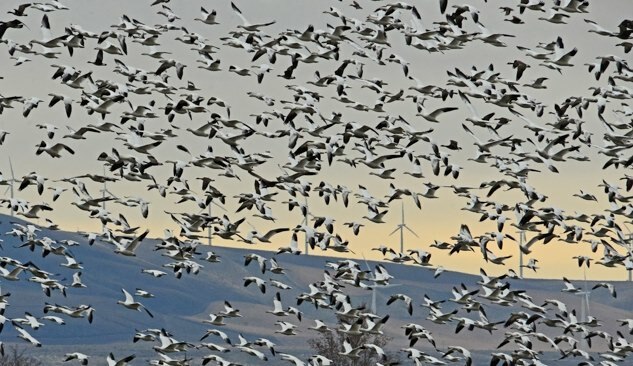 Then head west toward the Umatilla National Wildlife Refuge, where you can look for burrowing owls, overwintering eagles, mule deer and badgers. Just 7 miles south of Umatilla on US-395, the town of Hermiston has long been a stopover for travelers. 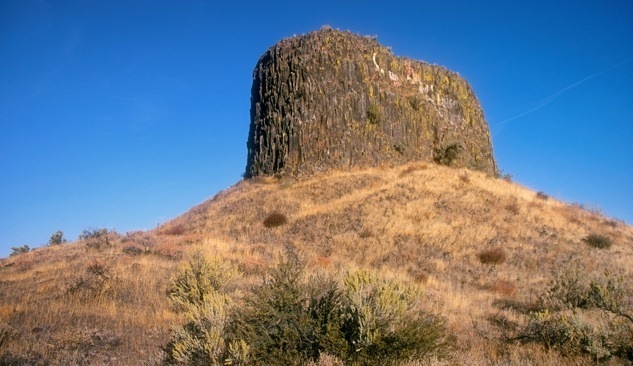 The Lewis and Clark Corps of Discovery passed the distinctive outcropping of Hat Rock, now a state park, and wrote about it in their journals. The town site in the 1860s was known as an overnight spot for horseback travelers who frequented an Old West hotel and bar here. The Maxwell Siding Railroad Display recalls a former time when rail was king. Visitors can view the early 20th-century rail cars and collection of railroad memorabilia. (Tours are available by appointment.) Hermiston saw an agricultural boom in the 1970s, which was the start of its now famous watermelon farming. Get a taste at Bellinger Farms, which offers seasonal produce as well as gourmet spreads, jams and jellies. Try the casual farm-to-table cuisine at Walker’s Farm Kitchen, with dishes like flash-fried pork shanks with green chile pulled duck and the dorklette (that’s duck and pork) sliders. Come in August for a galloping good time at the Farm-City Pro Rodeo. Take US-395 south for another 9 miles into the historic town of Echo, located on the floodplain of the Umatilla River. Named for the daughter of an early settler, the little town has fewer than 800 residents and an impressive 10 buildings listed on the National Register of Historic Places. Visit the 1916 Echo City Hall — which also houses the town library, a community center and a museum — and the Koontz House, an elegant Italianate building constructed in 1881. Stroll through Echo’s quiet streets on a self-guided tour of 17 historic buildings and sites on the Echo Heritage Trail. Visit Fort Henrietta Park, a National Historic Trail site, to walk the same ground as pioneers who rested here on their westward journey. The river and surrounding valley make Echo a great locale for fishing and bird-watching. Sip estate-grown wines in the tasting room of Sno Road Winery, which is housed in the historic Koontz Building, a beaux arts-style edifice that once operated as a grocery store. Sno Road has a delightful list of award-winning varietals, including tempranillo, carmenere and zinfandel. Down the road, Echo Ridge Cellars has repurposed a former grain elevator into a stylish new tasting room, with weekly live music on the back patio. H & P Cafe is the spot for hearty breakfasts, tasty burgers, daily specials and a kids’ menu. From Echo, take OR-207 south for 45 miles to the agricultural town of Heppner in the foothills of the Blue Mountains. With rolling hills, river canyons and scenic farmland, it’s easy to see why this area has both an Oregon Scenic Byway (Blue Mountain Scenic Byway) and a scenic bikeway (Blue Mountain Century Scenic Bikeway). Those same Blue Mountains are a destination for hunting, fishing, cross-country skiing and hiking. At the heart of town, find the elegant courthouse, a 1902 construction built out of blue basalt. Visit the Morrow County Museum to explore the rural roots of this pioneer town and learn the tragic story of the day in 1903 when a flash flood killed 247 of the town’s residents. The Morrow County Agriculture Museum recounts the area’s rich farming history. Stop in at the lunch counter at Murray’s Drugs, open since 1959, for soups, sandwiches and salads. Look for your pot of gold at the annual Wee Bit O’ Ireland celebration held around St. Patrick’s Day. Editor’s Note: The highways and back roads in Eastern Oregon lead to remote places, so make sure to top off the gas tank. Check road conditions before setting out, and avoid these routes in winter.